Ringo Starr and Paul McCartney delighted fans when they reunited on stage this weekend at the Grammy Awards. 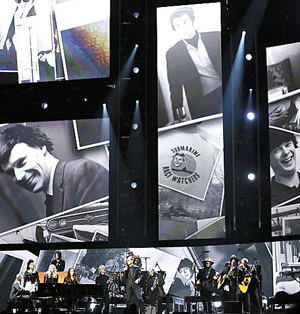 The Beatles won the 2014 Recording Academy Lifetime Achievement Award, with Olivia Harrison, Yoko Ono and Ringo Starr accepting the honour in a special pre-Grammys ceremony. The two surviving Beatles performed McCartney’s new song, ‘Queenie Eye’, as Olivia, Yoko and Sean Lennon danced in the audience. Ringo also sang ‘Photograph’, with images from his limited edition book and prints series projected throughout his performance.